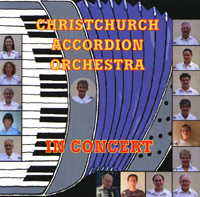 The Christchurch Accordion Orchestra formed in 1972 when there were five accordion orchestras in Christchurch, this orchestra is the sole survivor. 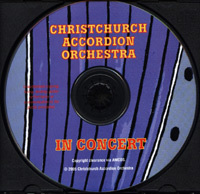 It has won the New Zealand Championship several times, toured extensively giving concerts in the South Island of New Zealand and has been a guest artist at numerous charitable fundraisers as well as entertaining the elderly. These days the orchestra performs in a very lighthearted manner with an emphasis on the joy of making music for fun as well as entertainment. They often perform for the Lions Club and the Scottish Society in Christchurch and are currently working towards a tour of Brisbane, Singapore, Mauritius and Reunion Island in the Indian Ocean. 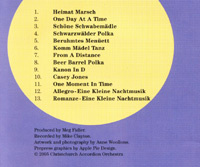 Orchestra members are Meg Fidler (conductor), Kim Norrell, Merle Kershaw, Lynette Kelcher, Rosalie Taylor, Faye Lawrence, John Dooley, Paula Turnbull, Ryan Hawes, Heather McCausland, Karl Barrett, Jill Voss, Max Powell, Mark Perry, Bernie Holtmark-Vandijkerhof (drums) and Jack Joslen (bass).